Yes, Daleside took some time to come up with that great headline. It could have been 'Borrowdale do it again' or 'Purple fails to disappoint' but Daleside remembered that yesterday a promise had been made and an 'exciting race report' must be provided. And - it was an exciting race, just not for first place. Borrowdale won by 16 minutes and 55 seconds. (Thanks Ali Welsh of Bowland for your lightning quick calculations - now we know why they call you Lighting Quick Ali!) 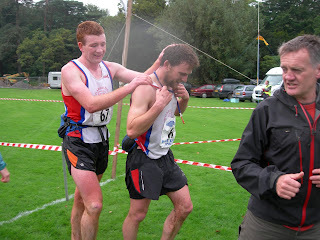 This is by more than a country mile, it's probably more like 3 miles at Borrowdale Fell Pace. So without wanting to take anything away from 'Team Start Wearing Purple' we need to look at second and third place for the exciting news. With Borrowdale lengthening the lead as the relay weaved its way through the legs (Leg 1 - 2 mins ahead, Leg 2 - 5 mins ahead Leg 3 - 13 mins ahead) Pudsey and Bramley looked likely for second place having given Borrowdale a real run for first dibs in the cake tent last year. 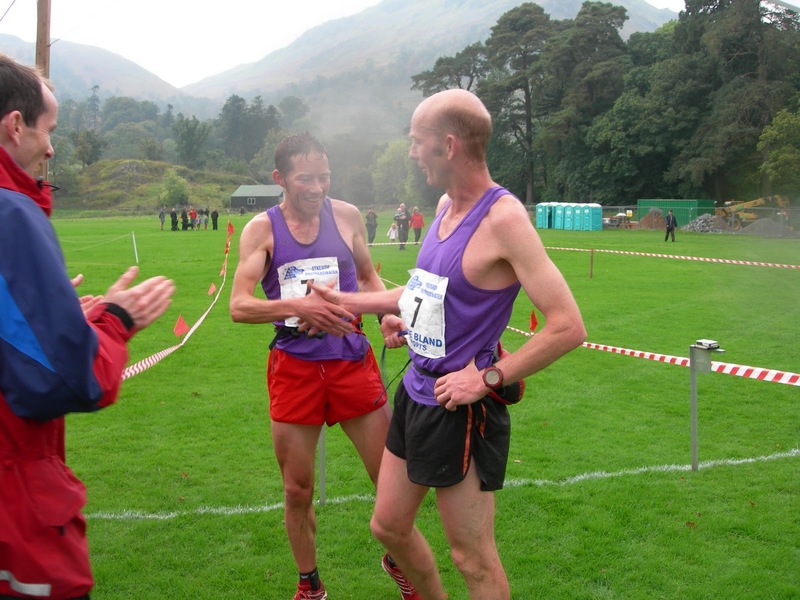 Borrowdale have won this event every time it's been held since 1995. Pudsey and Bramley were fielding a good team including fell superstars John Heneghan, Darren Kay, Danny and Rob Hope and Graham Pearce. Daleside spoke to the Pudsey and Bramley Leg 1 runners (Mick Hill and Matt Lockyear - who incidentally could name the MP for Pudsey) before the start. They knew the pressure they were under and were ready for it. If Borrowdale passed them they admitted they would be prepared to use Mick's Javelin. At the last changeover, Wharfedale went through in third place but were overtaken by Ambleside on the first climb up Dove Crag. Rather than fight for the position, Sam Watson and Ted Mason tucked in behind and let Ambleside lead them through the mist to Hart Crag and St Sunday Crag. Then on the descent of St Sunday, as the mist cleared, the Wharefedale boys caught sight of Graham Pearce and Rob Hope a few hundred metres below them. Both Sam and Ted are excellent descenders, having cut their teeth (and knees) in the BOFRA League (where racing is short and rough) and caught the Pudsey boys whilst still on the fell. The race for the line was very exciting for everyone watching but Wharfedale knew they had stolen enough seconds from Pudsey to 'High Five' coach David Hird in the finishing straight (Ali Brownlee style!). Some of the Borrowdale lads saw how fast the Pudseys were approaching and shouted "Run!" to Sam and Ted. 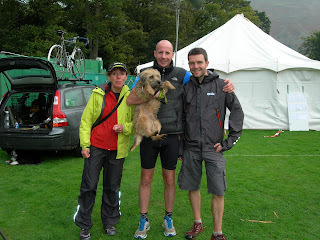 And so it led @Fellrunninbrief to decide what title should be given to today's report - "Sam and Ted's Excellent Adventure!" Sam said "I think we owe the Ambleside lads a pint". I'd take him up on this if I were you! Ok enough of this; FRB readers want facts; Here they are. Just seven seconds (calculated by TMAli Welsh) decided this competition! 3 Borrowdale - 4:25:54 - who also qualified for the Vets 3rd Prize. "What a fantastic day out. The result for the Mixed Teams really couldn't have been closer. Bingley's Ian Holmes and Andy Peace were over two minutes ahead of DazH and Adam Perry at the top of St. Sunday Crag. The Pennine pair gave it absolutely everything and finished just seven seconds behind Ian and Andy - gaining on them every step of the way. If only the finish line had been at the far end of the field!! Borrowdale came in a few minutes later which meant the top three Mixed Teams were 12th, 13th and 14th overall, which I'd say is pretty impressive."